27" Overall Length 10.25" Shoulder to Elbow, 9.75" Elbow to Wrist, 7" Wrist to Finger Tip 3" Width of Palm Articulate arms where shoulder, elbow, wrist, and fingers are adjustable in a full range of motion, same as a human range. Arms are made of plastic with a wood grain printed surface. Includes accompanying shoulder joint sockets. Sold in a pair - 1 left arm and 1 right arm. Arms can be disassembled in 2 spots. The hands can be unscrewed at the upper wrist and the elbows can be pulled apart at the joint. The tension at the shoulder and elbow joint can be adjusted by tightening the screw inside. Articulate arms where shoulder, elbow, wrist, and fingers are adjustable in a full range of motion, same as a human range. Arms are made of plastic with a wood grain printed surface. Includes accompanying shoulder joint sockets. Sold in a pair - 1 left arm and 1 right arm. Dress form NOT INCLUDED. Arms can be disassembled in 2 spots. 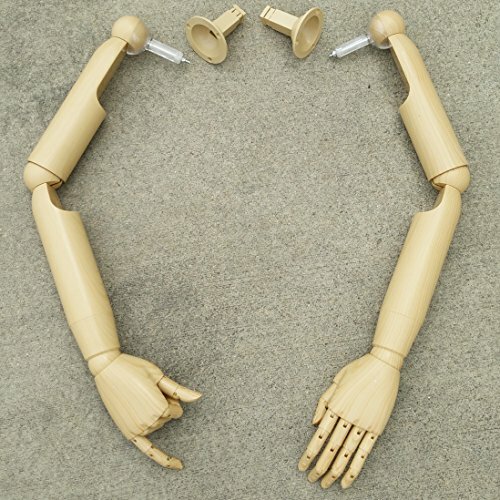 The hands can be unscrewed at the upper wrist and the elbows can be pulled apart at the joint. The tension at the shoulder and elbow joint can be adjusted by tightening the screw inside. If you have any questions about this product by DisplayImporter, contact us by completing and submitting the form below. If you are looking for a specif part number, please include it with your message.